We are a prominent name, which is engaged in delivering a comprehensive range of Hypertherm Plasma Torch Parts. The offered range is developed utilizing premium grade raw material and innovative machinery in conformation with the industry laid norms and standards. Along with this, the offered range of hypertherm powermax parts is available in different customized specifications in accordance with the emerging requirements of clients. 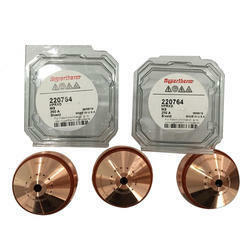 Customers can easily avail from us this high quality range of Hypertherm Max200 Consumables-Electrode. The offered electrode is a prominent part of the plasm torch and is used for welding purposes. Customers can easily avail this electrode from us at the most comprehensive prices. We offer these electrode in surplus as well. We are a leading industry in this domain, manufacturing in Hypertherm Powermax 85 Consumables Parts. Tested and manufactured as per the standard specifications only so that is serves the purpose right, customers can avail this range from us at comprehensive prices. 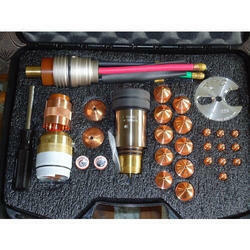 Our engineers have well maintained the quality of these parts. 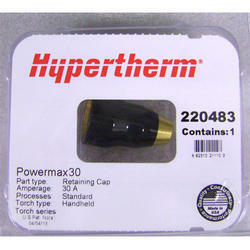 Our organization specializes in manufacturing and supplying an exquisite range of Hypertherm 1250 Powermax Retaining Cap. This cap is used in plasma cutting torches and offers usage ease of the same. Customers can avail these products with the standard specifications as per their requirement. Looking for Genuine Hypertherm Plasma Consumables ?